At MGM China, sustainability is about doing well by doing good. To ensure the long-term success of our business, it is fundamental we look after those who mean the most to us, including: our employees, customers, the communities in which we operate, our Shareholders, business partners and suppliers. It is also equally important to take care of the earth and its precious natural resources, which we depend on for life itself. This ethos is the foundation of our sustainability vision, “Create a Better Tomorrow Today”, signifying that the decisions we make today, will affect the society and the environment of tomorrow. Our vision serves as a call to action to operate a sustainable and responsible company where our business activities positively impact the people and environment of Macau. Commitment to Responsible Business: We are committed to have governance systems in place to best manage sustainability risks and opportunities. We will include important stakeholder groups in the development of our sustainability programs through regular reporting and engagement initiatives. Commitment to Social Responsibility: We are committed to provide employees with a great place to work and develop. We will give back to the community and invest in its long-term development and prosperity. Commitment to Environmental Responsibility: We will continuously work to minimize the environmental impacts of our business operations. Based on these pillars, the following have been identified as the most material areas to our business through internal and external analysis and consultation which is updated on an ongoing basis. Our sustainability strategy, along with this sustainability summary is structured according to these material areas. In 2016, the United Nations set a new global agenda for human progress and social impact through 17 Sustainable Development Goals, to make dramatic progress on development issues by 2030. MGM has identified three SDGs where we believe our Sustainability Strategy can make the greatest impact. We continue to implement and enforce policies that respect human rights and create economic opportunity throughout our supply chain. We employed 9,266 employees in 2017. Our employee learning and development initiatives help our employees to reach their full potential and rise through the ranks and contribute to the skills of the local community. Through our anti-human trafficking program, MGM hopes to contribute to the SDG’s target (8.7) of eradicating modern slavery by 2030. Understanding that two thirds of the global population will live in cities by 2050, MGM strives to promote inclusiveness and support the vulnerable in our community through our community engagement program and charitable contributions. Through our environmental sustainability programs we support creating a greener and cleaner Macau and provide awareness raising for team members and for the community. Both contributing to arts and culture in Macau, as well as preserving age-old traditions are a core part of our sustainability program. MGM integrates a resource efficient mind-set into all that we do. During the design, construction and renovation of our properties, thoughtful attention to the reduction of energy, emissions, water and waste is given. 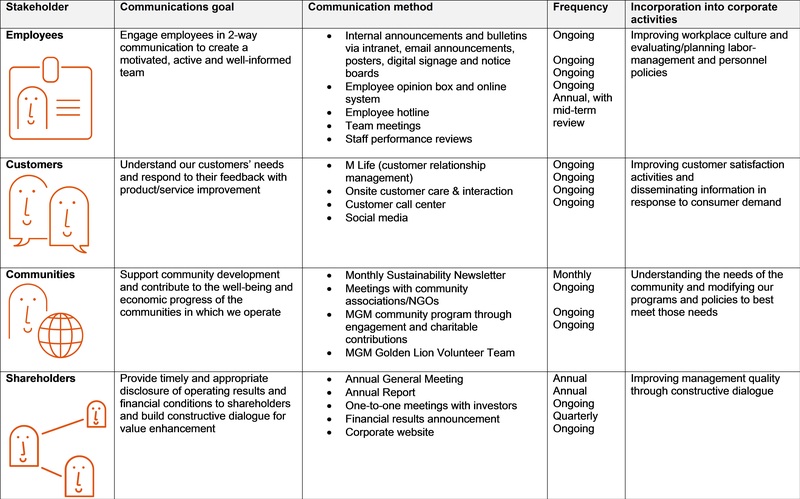 Operationally, MGM works to ensure each department is working on its impact areas through its Sustainability Committee and Green Team. MGM also encourages responsible consumption of our guests by ensuring their stay is not only luxurious but also sustainable and work hard behind the scenes to ensure this. Offering sustainable options is an area we are continuing to grow, for example sustainable spa, F&B and events options. We also recognize the importance of a collaboration with our suppliers to ensure we are working towards the same goals and maximizing resource efficiency. Formed in 2012, the MGM Sustainability Committee (“Committee”) is responsible for establishing policies, programs and procedures that help move us towards fulfilling our sustainability vision and goals. The Committee includes senior representatives from across our departments, ensuring that a committee member champions each of our important impact areas. We also have a team of dedicated sustainability professionals that are responsible for the daily implementation of our sustainability objectives and targets. Department-specific teams support our Committee and help to bring an integrated approach to our efforts and communicate top down. Our Resource Efficiency Team champions the technical aspects of the resource efficiency of our operations, meeting monthly to discuss environmental management opportunities and implementation. Our Green Team includes employees from across our operations with the aim of finding ways to engage and inspire fellow team members to help us achieve our environmental objectives. Coordinated by our Human Resources Department (“HR”), our Golden Lion Volunteer Team consists of over 950 employees who donate their time, effort and skills to help us make a positive difference to our community. Ultimately our Board has overall responsibility for our sustainability strategy and reporting. In line with the Corporate Governance Code, the Board is responsible for evaluating and determining the Company’s sustainability-related risks, and ensuring that appropriate and effective sustainability risk management and internal control systems are in place. Senior management provide confirmation to the board on the effectiveness of these systems. Where relevant, executive compensation is tied to achievements in sustainability objectives. Engaging our key stakeholders in long-term dialogue provides important input that informs our decision-making to continuously help us strengthen our company policies and programs. Throughout the course of any given year we communicate with our stakeholders through various channels as indicated in the table below. Apart from these key stakeholder groups we also seek and welcome feedback from broader society including government, NGOs, academics and other local associations with a view to continuously build relationships with the local community and strengthen risk management approaches. We are governed by clear policies and practices to ensure no unfair or misleading marketing information is delivered to consumers. Feedback is actively sought from our customers, with any material feedback provided being seriously considered by senior management and used to update our policies and practices. To date no customer data privacy breaches or unfair marketing cases have been reported. Our Code of Conduct is applicable to all staff and provides guidelines on how employees should conduct themselves at work. The Code of Conduct covers matters such as anti-corruption, use of confidential information, conflicts of interest and insider trading. Anti-Corruption Guidelines supplement our Code of Conduct and provide guidance to ensure compliance with all applicable anti-corruption laws. Available to all staff, the guidelines provide a clear definition of what anticorruption is, what the associated risks are and what each one of us can do to maintain practices that counter corruption and extortion. An Integrity Hotline is maintained by an independent third party service provider and operates on a 24/7 basis to report concerns of unethical behavior related to us. Training on ethical business conduct is provided to all employees upon induction and comprehensive training is provided to all assistant-managers and above, as well as to selected suppliers. Our suppliers are required to adhere to our Vendor Code of Conduct, as well as our Sustainability Policy. Site visit inspections are carried out to ensure compliance with contractual obligations and company sustainability expectations such as health and safety, environmental compliance and ethical business conduct. In 2017, the Group was in compliance with all applicable laws and regulations. Further, there have been no legal cases regarding corrupt practices brought against us or our employees during 2017. Selected by the Hang Seng Indexes Company to be featured on the Hang Seng Corporate Sustainability Benchmark Index, which identifies the top sustainability leaders in Hong Kong and Mainland China that are listed on the Hong Kong Stock Exchange. This is the second year MGM China has been selected. Awarded with the Outstanding Corporate Social Responsibility Award at the 6th Cross-Strait-Four-Region Outstanding Corporate Social Responsibility Award Ceremony organized by The Mirror Post Hong Kong. Awarded for Outstanding Contribution in the Field of CSR at the Asia Gaming Awards Ceremony. Recognized with the Outstanding Social Caring Organization Award at the 5th Social Caring Pledge Scheme organized by Social Enterprise Research Institute (SERI) of Hong Kong. Received the Mother Friendly Award, the Father Friendly Award as well as the Outstanding Family-Friendly Employer Award and on top of that the Gold status in the latter award category, in a ceremony organized by the Woman's General Association of Macau. Recognized by the Hiring Disabled Staff Recognition Scheme, an award scheme organized biennially by the Labour Affairs Bureau and the Social Welfare Bureau. Received 15 awards at the second F&B Occupational Safety and Health Award Program organized by the Labour Affairs Bureau. Recognized by the leading financial publication, Institutional Investor, as Most Honored Company in the 2017 All-Asia Executive Team survey. MGM swept up a total of 6 awards demonstrating the company’s ongoing commitment to, and support of, its Investor Relations. Awarded with a gold award in Excellence in Retention Strategy, as well as two bronze awards in Excellence in Employee Development and Leadership Development at the HR Innovation Awards. Received the Asia Responsible Entrepreneurship Award from Enterprise Asia for the “Investment in People” category. MGM MACAU named as a Forbes Travel Guide Five-Star Hotel, recognizing the resort’s high standard of service, amenities and diversified offerings. MGM MACAU named Best Business Hotel in Macau in the 10th Annual TTG China Travel Awards 2017. MGM COTAI awarded as the Most Anticipated Hotel by the Guangzhou Daily and again by the Voyage Best Hotels Awards.